Knowing how well your neighborhood public schools are doing so you can choose the right one for your child has not been simple in Los Angeles. 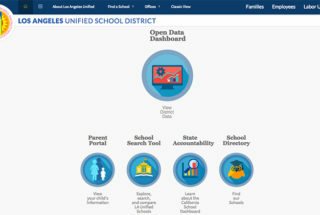 But on Friday, LA Unified, one of the most complex school districts in the country, took a big step toward becoming more parent-friendly and transparent by launching its Open Data website. There’s information such as academic performance, graduation rates, and college-going rates for more than 1,000 district schools, as well as what each school offers, like AP classes and sports. And yes, parents can now compare schools, up to three at a time. The district’s sought-after magnet schools are included, as well as its affiliated charter schools, but not independent charter schools. The district expects to add them later. More data will be included later this year, like test scores for specific student groups and budget information such as how much money is sent to underperforming schools. Data will be added in phases, based on input from parents and community members. The site, which is also available in Spanish, compiles district data from different official sources, such as the California School Dashboard, which has been criticized for not being parent-friendly, and other state data. The board also recently passed a resolution to create a new school assessment tool that will give schools a single rating, which will be coming separately but may be included in the new site to make it easier for parents and the public to find, a spokesperson for Melvoin said. Up to three schools can be compared side by side on the site. From the Open Data homepage, click on “School Search Tool,” which will take you to the unified enrollment site. At the top right, click on “Find a School.” Enter a school’s name, then in the middle of the page, click “compare.” In the school search bar at the top left of the page, type in another school’s name. If you want to compare a third school, click the “compare” button again and add another school’s name in the school search bar. Then at the bottom of the page, click “compare schools” from the pop-up bar. Now parents can see things such as what programs the schools offer like dance or visual arts, what sports a school has, which after-school programs they offer, AP courses for high schools, English reclassification rates, special education services, if there are magnet or dual language programs, and what percentage of students feel safe at school. “The School Search Tool is an improvement for parents navigating a complex system for what should be a simple step: choosing high-quality schools for their children. There is much more work to be done to create more equity in the application and enrollment process. Let’s think of this as a first and important step,” Vanessa Aramayo, executive director of the Alliance for a Better Community, said in a statement released Monday by the PEAPS- LA coalition. District and school level statistics on measures that show the percentage of students who go to college, persist in college from their freshman to sophomore year, and graduate from college. There are video tutorials to help navigate the Open Data portal. To get there click, “Need more help?” at the bottom left corner of the homepage. The help desk is also available to provide assistance and address questions; call 213-481-3300 from 8 a.m. to 4 p.m. on weekdays. *This article has been updated to add comments by the PEAPS-LA coalition members and the Alliance for a Better Community.